Mavericks is the first OS X release since Snow Leopard that doesn't constantly make you stop, consider a new feature that has just made your life worse in some incomprensible way, and then hope very hard that this is a bug, because it cannot possibly be an intended feature, because the world is, at a rest, a basically good place where people (like software engineers) do not deliberately inflict things like Launchpad on good, hardworking people. And that's a decent enough start. 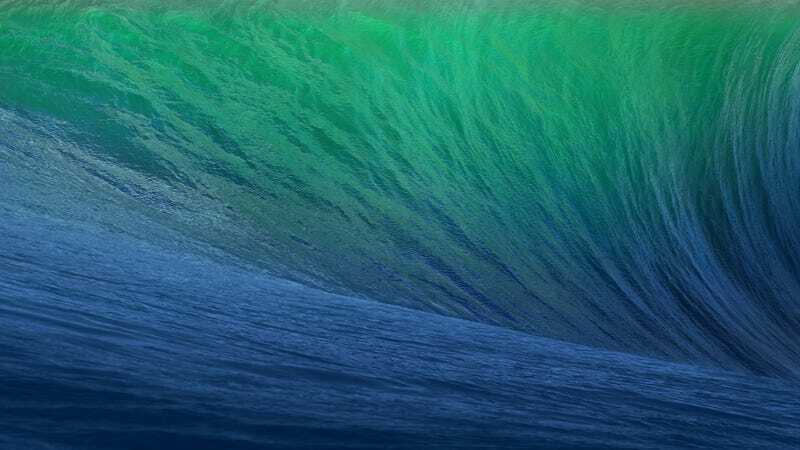 As with any beta, anything written about OS X Mavericks can and probably will change over the next few months. So instead of talking about bugs and hiccups, we'll focus on the main features of the OS as they appear to be implemented now. The biggest aesthetic change is a redesign to the Calendar app, which in addition to losing its Wild West chaps and vest, was cleaned up in a few ways (notice the nice typography update to the month and year). The nicest touch is Month view, which now has a nondescript light red bar across the top of the current week, and the current day's section of it is a darker shade. Nice visual cue for where to stick your eyes. Full-featured desktop notifications are great. When you mouse over a Messages notification and hover for a second, you'll get options to reply. Click reply and you can type directly into the notification banner and send the message. Same deal with email. This is pretty nice for when you're working in a different desktop—or even if the Messages window is buried under a bunch of crap—and you want to reply to something that just came in without disrupting your work space. Mavericks promises a hefty boost to battery life, even for current laptops not running new Haswell chips. Anecdotally, we haven't seen much improvement on our 2012 MBA with Ivy Bridge. The Low Power/we're-running-out-of-battery-you-idiot notification is no longer an interrupty pop-up. Instead, it's a standard notification banner. This is a nice loss of annoyance that will, over the lifespan of a laptop, probably cause you to be totally mystified about why your rig shut off suddenly and without warning a few times. It's a fair trade-off. The first Space is no longer locked into place! You can move the farthest left space around like any other space. It had been strangely locked into place since Lion in 2011. The new two-monitor functionality works great on a broad level. You can maximize a text editing app on one screen, and function perfectly normally on the other. Or you can just plug your laptop into your monitor and maximize, say, your calendar, or TweetDeck. Full-screen, uninterrupted app on one display, functioning workspace on the other. That's how this is supposed to work. This does have the added effect of separating your two monitors' spaces when you unplug and go back down to one. So if you have, say five Spaces on each screen, the ones paired with your very first desktop (One, Six) will not combine into one, as the old Spaces did. Instead, you'll have ten spaces on your single screen, and the windows in that One-Six pair will be in actual Spaces One and Six. Minor pain, but nothing compared to the hell it's replacing. A very slightly less minor frustration is that when you change the orientation of the two screens (by dragging the top bar from one screen to the other in System Preferences > Displays > Arrangement), thereby switching the screen where your notifications and app switcher appear, ALL of your apps jump from one screen to the other—they're pinned to the "main" or "auxiliary" screen, not the specific display they're on. The Notification Center is no longer textured like the inside of a really nice pencil case. Game Center still looks like its old, cheap casino self—for now, at least—but it's nice that one of the more used hubs gets a minor facelift, along with Calendar. Opening a new Messages chat box brings that person's box to the top of the Messages window, instead of shooting you down to wherever it had been. This is a nice change. Tabs in Finder work fine. Holding Command while double clicking a folder opens it in a new tab (formerly new window), which is a decent touch. Otherwise, the keyboard shortcuts are the same as you'd find in a browser. Bluetooth is just as much of a pain to use as ever, so anything Apple's planning there seems to be still on the way. There are some random wobbly table legs, like problems calling the dock to the second display, that we can for now probably chalk up to it being a first build. Overall, this looks like a very nice update, even if it's mainly housecleaning for the past two years.